When Princess Cruises first gave us 360-degree views of their staterooms and suites, we were working with huge files and dial-up modems. (You remember those, don’t you?) Click on the button and within a couple of minutes you could “stand” by the bed if your cabin and look toward the window or move the mouse and look toward the bathroom. Could planning a cruise get any better? There have been lots of improvements since than, but Azamara just took the whole thing several steps further. 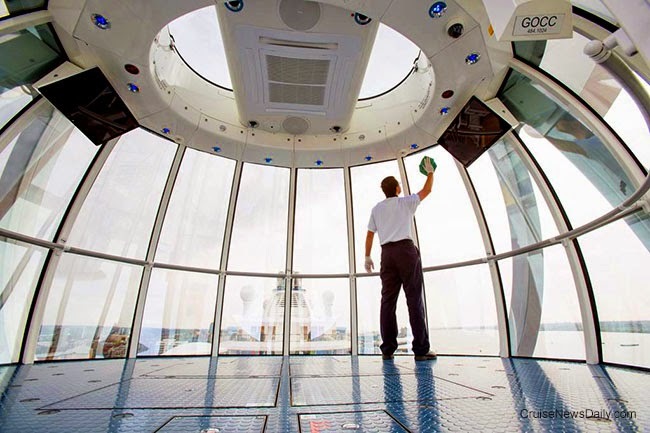 They have begun to offer 360-degree video, not just of the ship, but since they are all into destinations, you can experience some of their fascination ports of call and see all around you in video. The next best thing to being there. Cunard has produced a new video about their butlers. Don't understand what a butler would do for you? Once you watch this video, you'll understand why you suddenly feel the need for a butler the next time you sail on Cunard. You know all those theoretical discussions about what you would want to have if you were shipwrecked on a deserted island? Two men can tell you tonight - from experience - that two absolutely essential things are a satellite telephone and Celebrity Solstice sailing nearby. 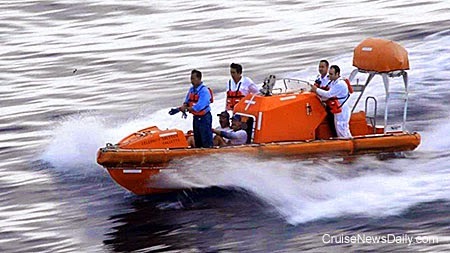 The crew of Celebrity Solstice performed a rescue on Thursday that was far from the usual sighting of a disabled boat floating out at sea and lowering a boat to pick up the people. Instead, the cruise ship went to a deserted island, found a save place to take a landing boat ashore, and radioed the men needing a rescue where to meet them. 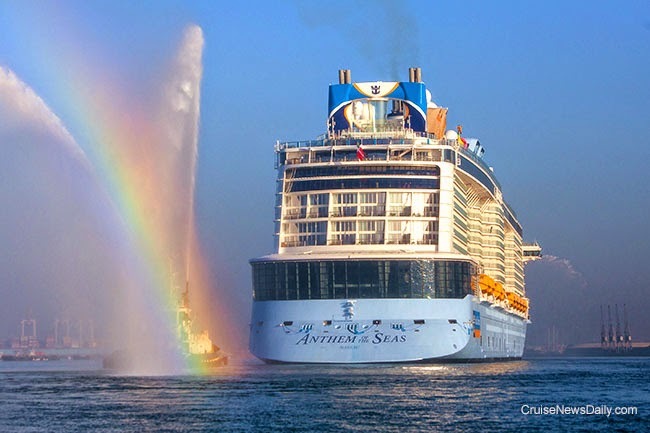 The complete story appeared in the April 17 edition of Cruise News Daily. Royal Caribbean's Anthem of the Seas is in its summer home of Southampton, and Saturday it will board its first visitors. We have the first look around this Quantum clone below and on our Pinterest board. Princess Cruises just released the preliminary information about their 2016-2017 program in Australia, and it’s going to be a big year - five ships and a 20% capacity increase. 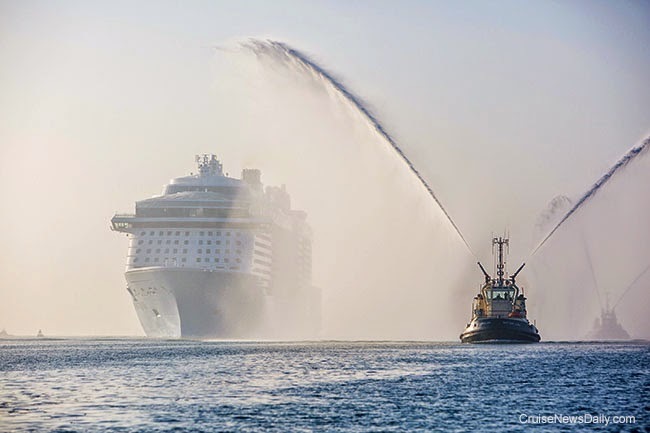 Responsible for much of the increase is the introduction of 3,082-passenger Emerald Princess. Adding to the excitement surrounding Emerald Princess is that it will be arriving in Sydney via a 42-day, four-continent voyage from Southampton. Two passengers from different Carnival ships collided while driving jet skis off Grand Cayman Wednesday afternoon. One man was killed, and his passenger was injured. Carnival Corp declared a 25-cent-per-share quarterly dividend today. The dividend is payable on June 12 to shareholders of record at the end of business on May 22. The 47,800-ton Viking Star entered service today at Istanbul. 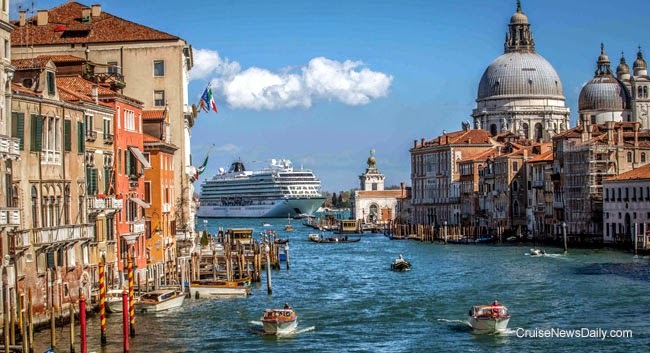 The ship is the first of a trio being built for the new Viking Ocean Cruises by Fincantieri. The line is a sister to the fast-growing Viking River Cruises, and the company wants to bring much of the same ambiance and philosophy to the new oceangoing vessels. In March we told you about the strength of the Chinese Cruise market being evidenced in Costa’s 86-day world cruise sailing from Shanghai, strictly for Chinese passengers. Costa Atlantica sailed on March 1 on a complete circumnavigation of the world with nearly 1,000 passengers, and it has now arrived in the US, first making a three-day call in New York. It’s Ours! It’s All Ours! Last September, when Meyer Werft purchased the majority of the STX Europe yard in Turku, the Finnish government retained an investment of 30% of the shares. Meyer had the option to take the rest of the shares at a future date if they chose. The German company has decided to acquire the remainder of the company. Royal Caribbean's Anthem of the Seas arrived at Southampton this morning. The ship will be homeported at the British port for the summer season. It’s obvious Australia is becoming more and more important to Royal Caribbean, while at the same time their traditional markets (such as North America) are becoming a little less important. Royal Caribbean said today they plan to make a splash in the Australian market by basing Ovation of the Seas there for the 2016-2017 season. The third Quantum-class ship will be the first brand new ship ever to be homeported in Australia, and it will also be largest. Carnival Cruise Line has released the artists and the schedule for another season of Carnival Live. Again, they are musicians you never expected to see playing on a cruise ship. The summer and fall season includes The Band Perry, BOSTON, Lionel Richie and Heart. Those artists complement the artists performing in the spring series: Journey, Rascal Flatts, Little Big Town, Smokey Robinson and Styx. Extra Bamboo Shoots for Everyone! On the House! Following what they did aboard Norwegian Star a couple weeks ago, Norwegian Cruise Line said today, they were eliminating the cover charge and a la carte pricing in many of their Asian restaurants across the fleet. While some of Princess’ ships may have water dancing across the top deck for the entertainment of passengers, for the ships based in Australia, Princess is taking a more practical approach and giving Australians what they want: beer and wine flowing freely across the top deck, and an abundance of whiskey from around the world to sample below decks. 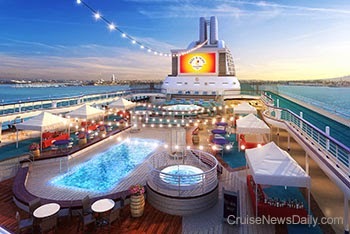 When Dawn Princess returns from drydock on May 25, it will be the first in the Princess fleet to offer a beer and wine garden festival on the ship’s top deck at least once per cruise, and twice on cruises of more than a week. Seabourn began growing again today. 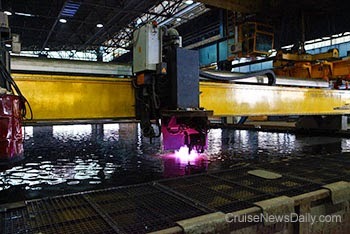 Fincantieri began cutting steel for the first of two ships they will build for the brand at their Marghera yard. The 40,350-ton Seabourn Encore will again push the Seabourn size larger by almost a third (compared to the Odyssey-class). It will carry 600 in double occupancy. With all the cruise lines rushing to get ships to China, they may want to prepare themselves for what appears to be a different way of doing business. Local newspapers in China report that nearly 400 passengers refused to disembark from Henna Cruises’ Henna when the cruise ended last Monday. The people were dissatisfied with the compensation being offered for schedule changes and some of the ship’s features not being open. SANTA CLARITA, Calif. (April 13, 2015) – Princess Cruises has appointed Brian O’Connor to the role of vice president, public relations, effective June 1. He succeeds Julie Benson who will retire May 29, after 32 years of service. In this role, O’Connor will lead the team accountable for media relations, publicity, social media, community relations, ship introductions and special events. He will drive messaging for product and program launches and be responsible for issues management and crisis communications. He will also oversee the collaboration among the international public relations teams in the United Kingdom, Australia and throughout Asia. “Brian brings more than 15 years of experience in strategic planning and creative campaign development to this integral role for Princess Cruises,” said Gordon Ho, senior vice president of global marketing and North America sales. “Princess will benefit from his leadership and his track record of developing and executing high-profile initiatives that will shape the narrative of our global brand and increase awareness among key audiences including media, retailers, consumers and employees,” added Ho. O’Connor joined the company in 2006 as director, public relations for Cunard Line elevating awareness for the brand in North America through such high-profile initiatives as Queen Mary 2 appearing in the premier episode of the hit series Mighty Ships created by Discovery Channel, the Britannia Ball gala fundraiser for the New York City Opera and the first performances by James Taylor and his band on a transatlantic crossing. He’s supported the launch of Queen Victoria with press events by partnering with NYC & Company and staging the first three Queens Cunard Royal Rendezvous in New York in 2008. He was promoted to director, marketing and public relations in 2009 and supported the launch of Queen Elizabeth in 2010. In 2012, O’Connor was appointed vice president, North America sales, responsible for leading the field sales team representing both Princess and Cunard. He is credited with strengthening trade relations and growing distribution with North America retail partners. As he transitions from sales he will complete his service as chairman of the CLIA Trade Relations Committee. Interviews to identify his successor are underway. Prior to joining Cunard, O’Connor served as director of public relations at The Beverly Hilton in Beverly Hills, where he was accountable for publicity and media relations for more than 125 events annually ranging from red carpet charity galas and political fundraisers to numerous award shows including The Golden Globe® Awards. In addition to positions held at Princess and Cunard, O’Connor is a past president and five term board member of the Public Relations Society of America – Los Angeles Chapter (PRSA-LA). He is also a graduate of the Protocol School of Washington’s protocol officer training and certification and is a member of Protocol Diplomacy International – Protocol Officers Association (PDI-POA). O’Connor is a graduate of Michigan State University’s School of Communication Arts & Sciences.